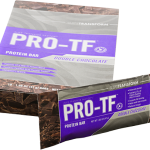 Delicious PRO-TF® Protein Bars are a satisfying, naturally flavored, and naturally sweetened way to help you achieve your body transformation goals. 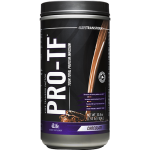 Get your pro on the go with this patent-pending, university-tested, and best-in-class source of protein. 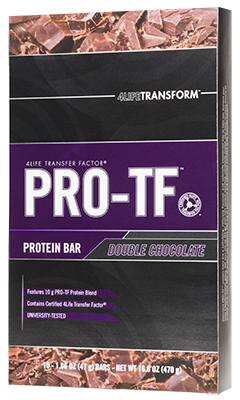 Plus, each PRO-TF® Protein Bar delivers 300 mg of exclusive immune system supporting 4Life Transfer Factor® Tri-Factor® Formula. Do you dream of a day when you wake up feeling your best? Not only would you feel healthy and ready to go experience life, but you’d also be proud of your reflection as you look in the mirror. Protein can help you get there! 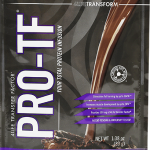 Transform your body with quality protein to help you burn fat, gain muscle, and achieve the optimal health needed to live a vibrant life. There’s a good chance you’re already consuming some protein in your diet every day—but are you consuming enough of the right kind of protein to help you meet your goals? 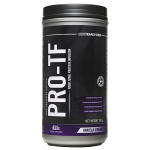 Learn how supplementing your diet with high-quality protein such as PRO-TF® can help you transform your body and your life. Protein supports fat burning in healthy adults of all ages. It’s a great addition to any healthy eating and exercise program. Not only can protein help you achieve your ideal weight, it can also help you feel fuller between meals and reduce cravings for unhealthy junk food that can derail your efforts. Protein can help protect healthy muscle in people of all ages, by increasing muscle growth and reducing muscle breakdown. A diet higher in protein than carbohydrates has been reported to provide the greatest benefit for reducing the adverse effects associate with age-related muscle and strength loss—the two factors most highly correlated with quality of life in later years.1 This makes protein an essential supplement for older adults who want to age well. Embrace an active and healthy lifestyle. Whey protein can be a powerful and effective tool to transform both your body and your health. Whether you want to support healthy blood glucose levels and appetite, improve sports performance and recovery, or just look and feel better, protein can help you achieve your goals. 1McLean RR et al. J Gerontol A Biol Sci Med Sci 2014;69(5):576–83. 2Pedersen BK & Febbraio MA. Nat Rev Endocrinol 2012;8(8):457–65. 3Helms ER et al. Int J Sport Nutr Exerc Metab 2014;24(2):127–38.